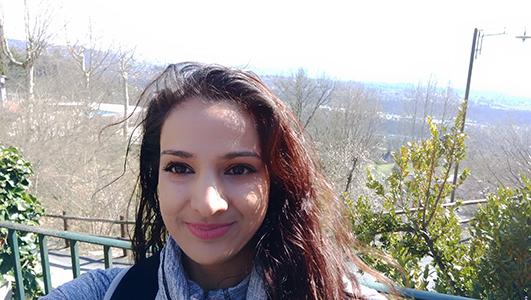 “Characterizing the assembly and molecular interactions of the fission yeast Atg1 autophagy regulatory complex,” by Tamiza Nanji, Candidate Yip Lab. Macroautophagy, often referred to as autophagy, is a non-selective degradation mechanism used by eukaryotic cells to recycle cytoplasmic material and maintain homeostasis. Upregulated under starvation to generate molecular building blocks for ongoing cellular processes, this pathway requires the coordinated action of six multi-protein complexes, the Atg1/ULK1 complex being the first. Although, the Atg1 complex has been extensively studied in Saccharomyces cerevisiae, far less is known about the biochemical and structural properties of its mammalian counterpart, the ULK1 complex. Unlike the S. cerevisiae Atg1 complex which contains five subunits (Atg1, Atg13, Atg17, Atg29, and Atg31), the ULK1 complex consists of four proteins (ULK1, FIP200/RB1CC1, ATG13, and ATG101) that are technically more challenging to study. In this study, I characterized the Atg1 complex from fission yeast, Schizosaccharomyces pombe, as the composition of proteins resembles the mammalian ULK1 complex but is more amenable to biochemical analyses. The Atg1 complex in S. pombe is composed of Atg1 (ULK1 counterpart), Atg13, Atg17 (FIP200 counterpart) and Atg101. We found that the interactions between Atg1, Atg17, and Atg13 are conserved while Atg101 does not replace Atg29 and Atg31. Instead, Atg101 binds to Atg1 and the HORMA domain of Atg13. Furthermore, Atg101 was previously shown to contain a conserved loop, termed the WF finger, postulated to bind and recruit downstream autophagy-related proteins and effectors. Using affinity purification mass spectrometry, we further investigated the potential interacting partners of S. pombe Atg101 under autophagy-inducing and non-inducing conditions. We obtained 625 proteins that co-purified with Atg101-GFP from cells grown in defined media. We used in vitro pairwise studies to confirm the interaction between Atg101 and prey proteins. 9 of the 16 proteins tested were confirmed including Fkh1, an FKBP-type peptidyl-prolyl cis-trans isomerase. We further explored the interaction interface between Atg101 and Fkh1 and found that the WF finger is required for the interaction in vitro. Although the S. cerevisiae Fkh1 homologue, FKBP12, interacts with rapamycin; Fkh1 it is not thought to be directly involved in autophagy. Collectively, our results give new insights into an Atg101-containing Atg1/ULK1 complex and reveals that Atg101’s function may span beyond autophagy. Thursday, March 28, 2019 at 9:00 am in Room 203, Graduate Student Centre, 6371 Crescent Road.